Star Natural Meats of Astoria, N.Y., is recalling approximately 20,000 pounds of raw, non-intact pork sausage. The product contains milk and soy, allergens not declared on the label. The product also contains restricted ingredients -- specifically sodium nitrite and sodium nitrate -- which are not declared on the label. 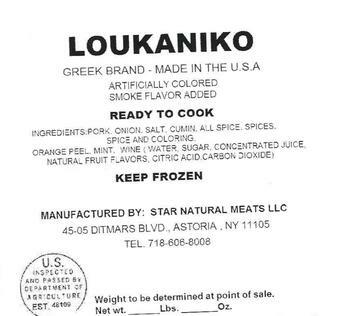 Individual packages of various weights of “LOUKANIKO GREEK BRAND – MADE IN THE U.S.A.” pork sausage. The recalled product, bearing establishment number “EST. 48109” inside the USDA mark of inspection and not labeled with a lot code or expiration date, was shipped to retail locations in Astoria, N.Y.
Customers who purchased the recalled product should not consume it, but discard it or returned to the place of purchase. Consumers with questions may call the company at (718) 606-8008.